Ever feel like you’ve seen a movie poster before? There’s just something about it…maybe the way the woman on the poster is posed, or the expression on her face, or the way she’s half hidden behind the main character. Maybe something as simple as the font style and the color of the background. It’s probably because you’ve seen almost the same thing, maybe a hundred times before. For anyone who doesn’t know the movies, the two can be summed up as fairly similar. In Cabin Fever, the characters escape into the woods for a fun, adventure-filled weekend when they are struck by a horrible disease that threatens to kill them all. In Shrooms, the characters also escape to the woods, but this time in hunt of psychedelic mushrooms. When the main girl accidentally ingests a poisonous mushroom, one that gives her a “bad trip” that she can’t separate from reality, before ultimately wondering whether she will die or not. The movies are extremely similar, and the posters for these movies reflect that. The skull in both is created from the environment, from a combination of light within the trees and the sky. This symbolizes that their environment is causing the problem; assumedly, the characters would all not be dying if they never adventured into the woods. 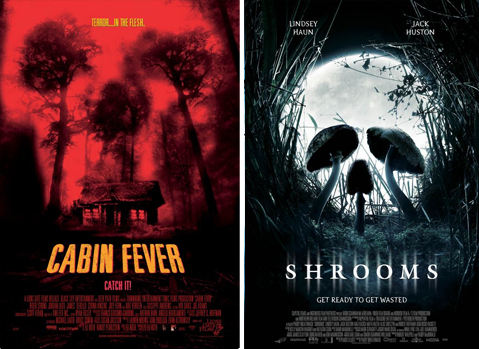 Shortlist.com outlines a number of these eerily similar movie posters. 9gag user Urugag shares a giant compilation of images which contrast the sheer number of movie posters with similar themes. This is going to be an action movie. You should expect action and violence. Jackie Chan is going to do some serious action scenes, and will dominate all of his enemies. The action in the movie is going to overpower any intellectual thoughts (hence the foot and fist being closer to the viewer, with his head far behind). But these are wonderful keys for the audience. If you like Jackie Chan movies, you’re going to like the one that the poster is advertising. If you know you don’t like the movies, you can stay away from the new movie. 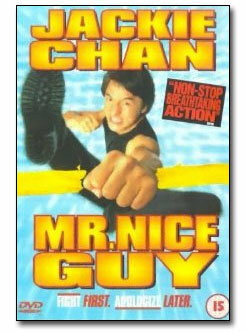 Other movies trying to emulate Jackie Chan’s expertise also copy this style. 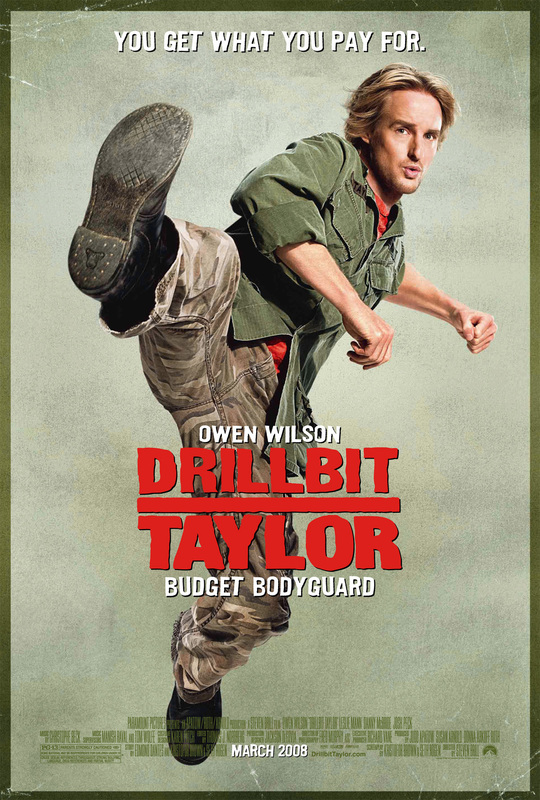 Even though Owen Wilson’s movie is obviously going to be a comedy, we can still expect to see action moments in a Jackie-Chan style. The real question: why not come up with a completely new movie poster, so that audiences can recognize that this movie is going to be something they haven’t seen before? One answer is obvious: because we have seen this before. Same movie with different characters means the director should at least acknowledge how similar his movie is going to be with the ones who came before it. Another answer is based on the audience. If the audience liked a movie with specific themes, then, in recognizing the similarities, they will be drawn to the new movie as something they already know they will like. If you like one movie about a vigilante, like V for Vendetta, you’ll probably like another, like Blade. It’s an easy way to point viewers in the right direction. It’s up to the viewer to decide whether he’s ready for repetition or a breath of fresh air. It’s not that we can’t enjoy them, but change is good. I began my project, Maps of the Imagination, wanting something more than a traditional map. I believed that if I asked others to draw a map of an intangible place, of somewhere they had to imagine completely, the results would be fascinating and a challenge to interpret. To illustrate how maps are more abstract and more personal than popular belief, I asked twelve people to create a map of his or her imagination. The task was not easy; the participants, including myself, all struggled with how to portray something in a tangible form that doesn’t literally exist (at least in the way that each of us could see it, with our eyes). I did not give any instructions about how to create the map outside of using a sheet of paper. Mo matter how confused the participant looked or how many questions they asked, I would not clarify the information any further. In this way, their responses would not be influenced by my own conception of an imagination. Maps that tried to reach for something larger, expressing the abstraction of the imagination. Once I identified these categories, I could fit the individual maps into each one and analyze them based on readings from Turchi, Wood and Hall. Finding the quotes themselves was initially challenging, but nothing that couldn’t be fixed by rereading and searching for specific keywords. After this, the only struggle I encountered was formatting the words and images next to each other in Word before changing the whole atlas into a pdf. Like most things outside of text in Word, there was only one way to put an image on a page by itself: multiple page breaks and columns. I can proudly say that I will be better at this the next time around, however. I have Word figured out and can reproduce the work much faster. All in all, I like how the Atlas turned out. The maps given to me by others were more than I could hope for, and each one helped to solidify the points that the authors were trying to say about maps. In the future, I’m going to look at maps with a much more critical eye.